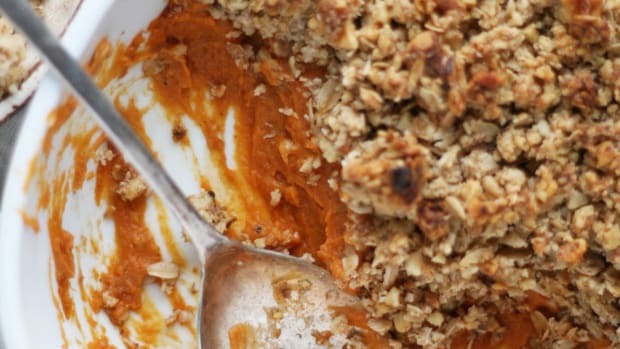 Why limit vitamin-packed sweet potatoes to lunch and dinner? 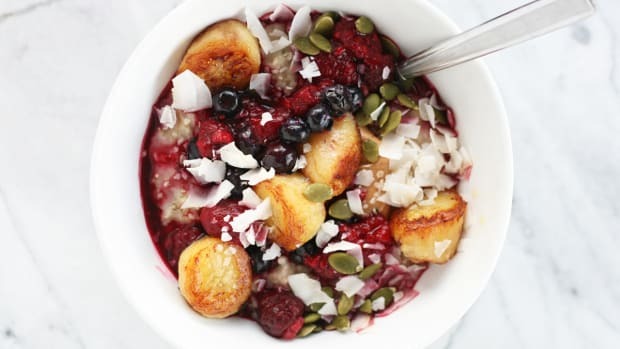 This nourishing sweet potato breakfast bowl is not only the best addition alongside your collagen-spiked latte, but it provides plenty of slow-to-digest carbohydrates to fuel the day ahead. You’ve got lots of Christmas shopping to do, after all. 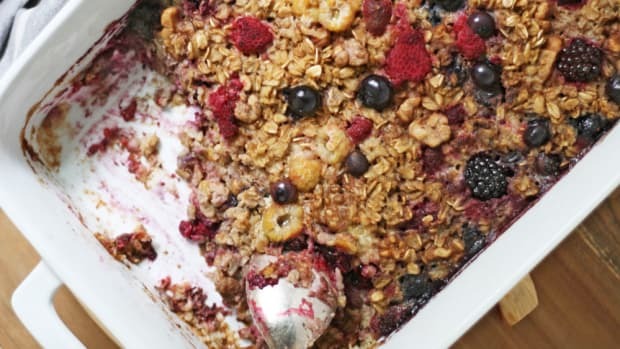 The standard American diet (aptly abbreviated as SAD) is filled with sugar-laden simple carbohydrates (and even worse, glyphosate), particularly when it comes to breakfast foods. These refined and processed carbohydrates (bagels, white bread, pastries, cereal) lack fiber, which means they are digested quickly and have a high glycemic index. This leads to rapid spikes in blood sugar and insulin levels after meals. Cue the mid-morning soda and snack break. 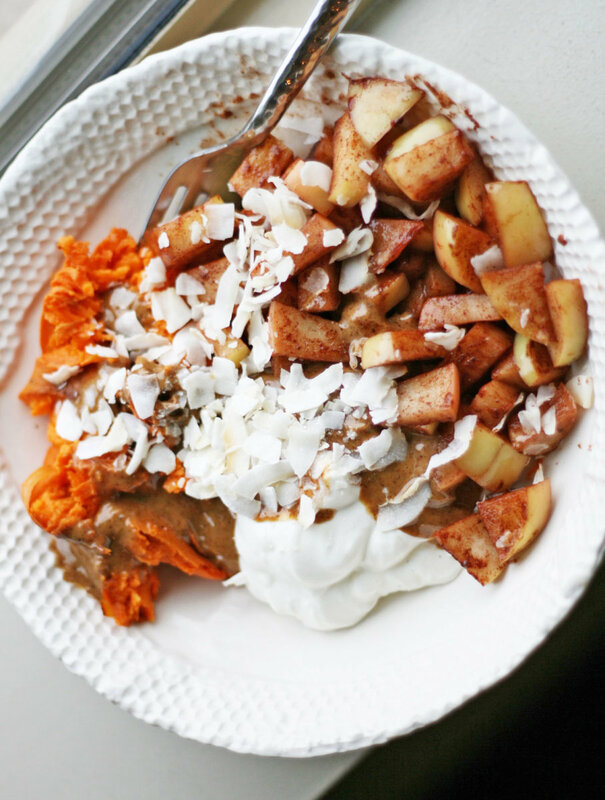 There’s a better way to start your day, and it involves healthy sweet potatoes in an easy-to-make breakfast bowl. These starchy and sweet vegetables contain complex carbohydrates to stabilize – not spike – blood sugar levels after eating. 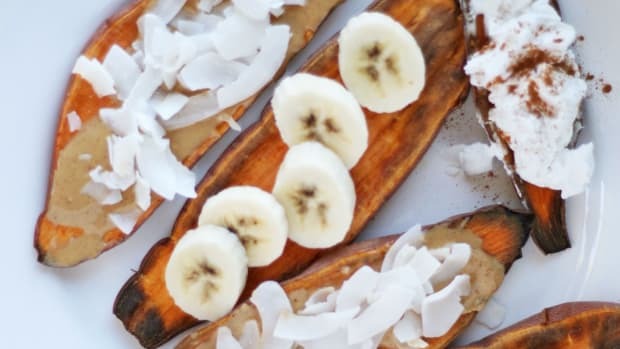 In fact, a particular sweet potato (the Caiapo variety) may even decrease fasting blood glucose and (bad) LDL-cholesterol levels, as well as increase insulin sensitivity in those with type-2 diabetes, according to one study. To make the most out of this nutrient-packed spud, eat it for breakfast. 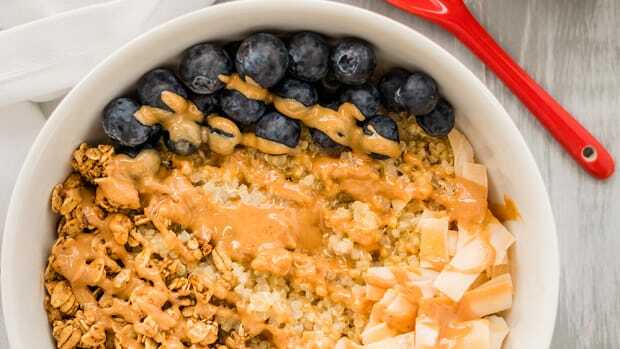 When combined with yogurt, cinnamon sautéed apples, and a drizzle of tahini or peanut butter for good measure, it’s the ultimate healthy breakfast bowl. 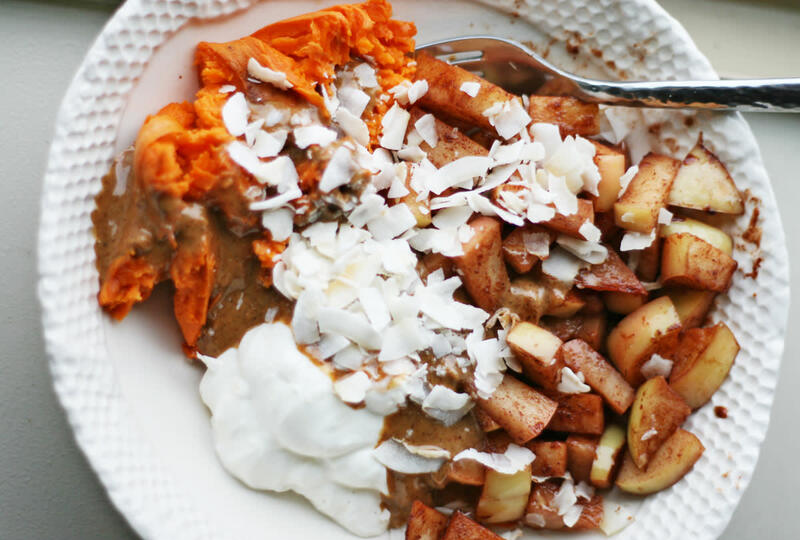 Healthy hack: to make this breakfast bowl even easier, batch cook the sweet potatoes. Bake multiple potatoes at a time and keep in the refrigerator to have on hand throughout the week. When ready to enjoy, simply warm them up or scoop out the flesh to mash and use in smoothies, baked goods, and more. 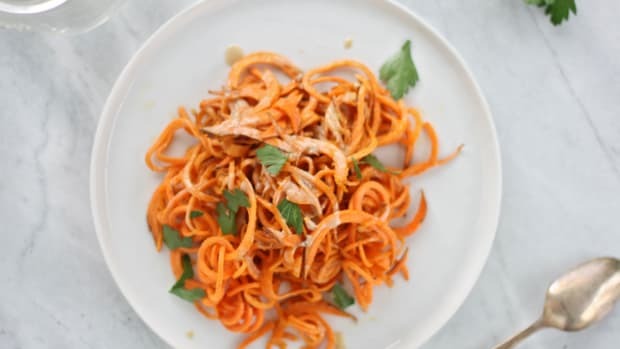 Finally, don&apos;t forget the peanut butter or tahini. 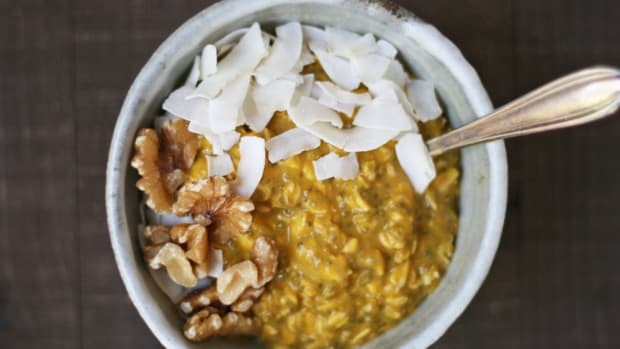 It adds essential healthy fat, (which makes beta-carotene more bioavailable) and gives the breakfast bowl a sweet and salty taste that&apos;s crave-worthy. Pierce sweet potato with a sharp knife once or twice and place on a lined baking tray. Bake in the oven to 45-60 minutes, or until potato is soft and squishy. Remove from oven and let slightly cool. 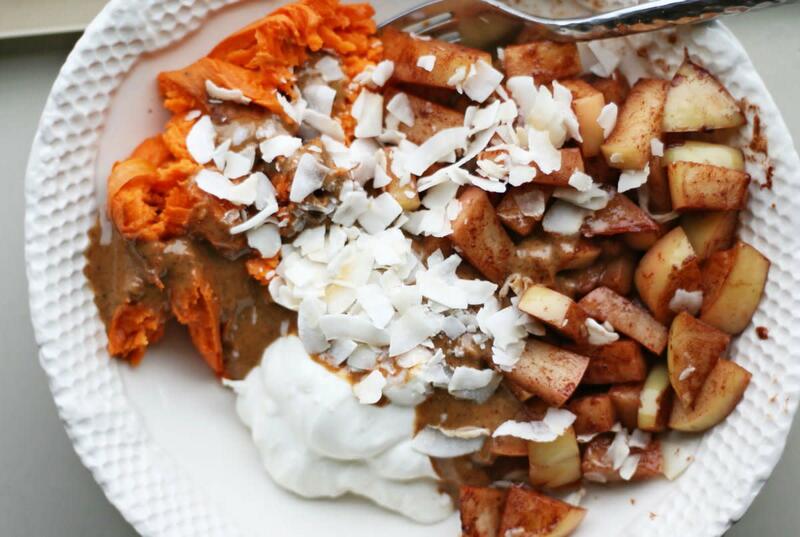 When sweet potato is nearly done baking, add coconut oil to a skillet and warm over medium heat. Add chopped apple, spices, and pinch of sea salt. Gently sauté over medium heat until apples are warm and tender, about five to ten minutes. Add a few tablespoons of water if the apples start to stick. When potato is cooled enough to handle, cut open and scoop flesh out into a bowl. Gently mash with a fork and sprinkle with a dash of cinnamon, if desired. To the bowl, add sautéed apple and yogurt of choice. 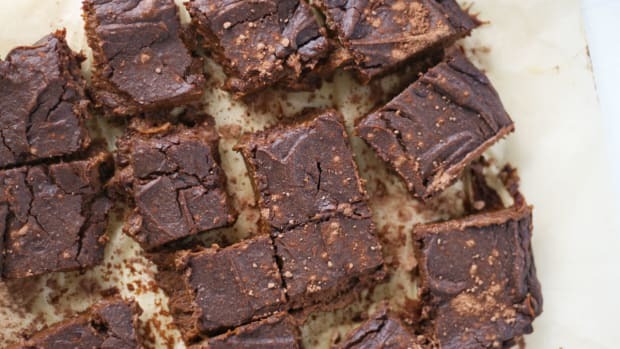 Drizzle with tahini or peanut butter, sprinkle with coconut flakes, and devour!